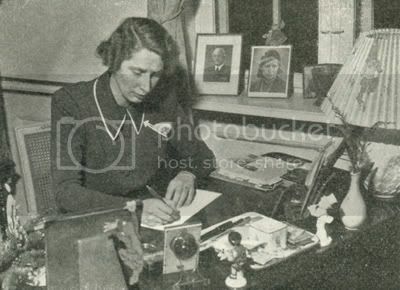 Marriage: In 1933 married Caroline Mathilde of Denmark, at Fredensborg. Only child with right to the throne is, ironically, his daughter, who didn't have any rights while her father was second in line. Scanned from: "Prins Knud af Danmark - Erindringer"
Picture from "Arveprinsesse Caroline Mathildes fotoalbum"
Picture from "Prins Knud - Erindringer"
Another picture of them together. 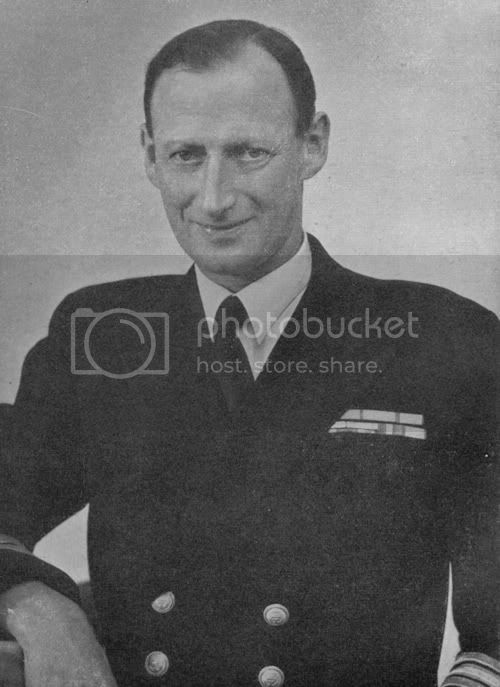 Both scanned from Prince Knud's biography: "Prins Knud af Danmark - Erindringer"
My understanding is that thay were first-degree cousins, can you confirm it? Was it still a usual doing at this time? 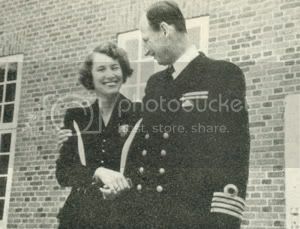 In the Royal Familyin 1933? I would say it is not unlikely. But I dont know. Anyone know if there are some new plans for their estate Sogenfri? I know it was under renovation a few years ago but from what I understod that was only the outside? First cousins, yes. Knud's father, Christian X and Caroline-Mathilde's father, Harald, were brothers. 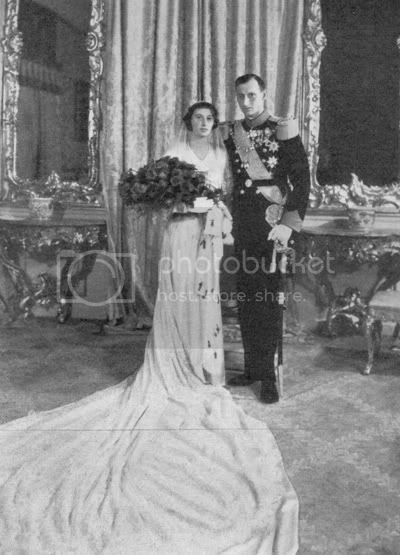 I don't know if it was usual doing, but King Olav of Norway (whose father, Haakon, was also a brother to Christian X and Harald) married his cousin (whose mother was the sister to Christian X, Harald and Haakon.) So, it happened. Why is their daughter a princess whilst the sons are only counts? Many thanks for you answer, Norwegianne. its old story about couple? It was pointed out to me sometime that without the change in the constitution in 1953, you would currently have Ingolf on the throne - who is childless, and after him his brother, Christian, who has three girls (who wouldn't have had any right to the throne.) After them, the nearest male would be King Harald of Norway. Of course, who Ingolf and Christian might've married may not have been the same if they'd been more directly in line at the time of marriage. I was, however, oddly reminded by this situation in Denmark - the king having only girls, when I read a few news-articles on the proposed changes in the Japanese succession rules a few months back. Knud had sons, and Frederik didn't. The Danish monarchy goes way back, like the Japanese, and still the Danes changed their constitutions, even as there were viable male heirs. Princes Margrethe was more popular then Prins Knud and the change of the succesion was used to carry other constitutional changes through. Photo on last year Prince Knud and Princess Mathilde on 1970 year? Photo on last year Princess Mathilde 1990? Photo on they funeral 1976 and 1995? It is not tru..the nearest male heir woud be CrownPrince Frederik because he is in direct line of King Christian10. and his wife Queen Alexandrine. King Harald of Norway is way way out in the line of claim about the Crown her in Denmark that is the same thing for his children. It says that King Harald and his children woud never be candidate for the crown of Denmark because the heir has to be in direct line from King Christian 10. and his wife Queen Alexandrine. 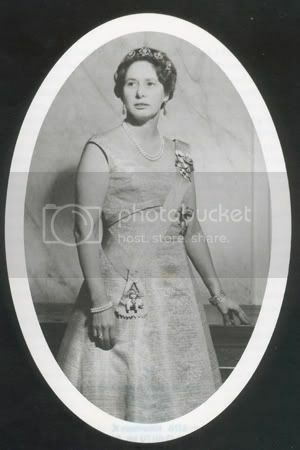 The Law is from 1953 and in that time King Frederik9.,Queen Alexandrine,Prince Knud was alive and Count Ingolf and Christian was still princes of Denmark until their marriede their wifes and became Counts of Rosenborg. Når kronprins Frederik får børn, vil de automatisk træde ind før prins Joachim og hans børn. Kronprinsens kommende børn vil således komme øverst i tronfølger-rækkefølgen. Derudover kan det læses i tronfølgerloven, som findes nederst i dette dokument, at kronprinsens eventuelle sønner vil have forret til tronen i forhold til hans eventuelle døtre. Dvs. at hvis kronprinsen først får en datter, som efterfølgende får en lillebror, vil det være lillebroderen der bliver kronprins og ikke den ældste datter. Udover prinsesse Benedikte har Dronning Margrethe en anden søster, prinsesse Anne-Marie. Hun gled dog ud af arvefølgen, da hun giftede sig med eks-kong Konstantin. § 1. Tronen nedarves indenfor kong Christian X og dronning Alexandrines efterslægt. § 2. Ved en konges død overgår tronen til hans søn eller datter, således at søn går forud for datter, og i tilfælde af, at der er flere børn af samme køn, den ældre går forud for den yngre. § 3. Dør en konge uden at efterlade sig til tronen arveberettiget afkom, overgår tronen til hans broder eller søster med fortrin for broder. Har kongen flere søskende af samme køn, eller er nogen af hans søskende afgået ved døden, finder reglerne i § 2 tilsvarende anvendelse. § 4. Er der ingen arveberettigede i henhold til bestemmelserne i §§ 2 og 3, overgår tronen til den derefter nærmeste sidelinie indenfor kong Christian X og dronning Alexandrines efterslægt efter linealfølgen og med tilsvarende fortrin for mænd fremfor kvinder og for ældre fremfor yngre som fastsat i §§ 2 og 3. § 6. Bestemmelserne i §§ 2-5 finder tilsvarende anvendelse i tilfælde af, at en konge frasiger sig tronen. Givet på Amalienborg, den 27. marts 1953. I would think so is William and Harry. Not 100% sure, but allmost. Thanks for the info! Gosh I can see who Elizabeth looks like, after seeing pictures of her mother.